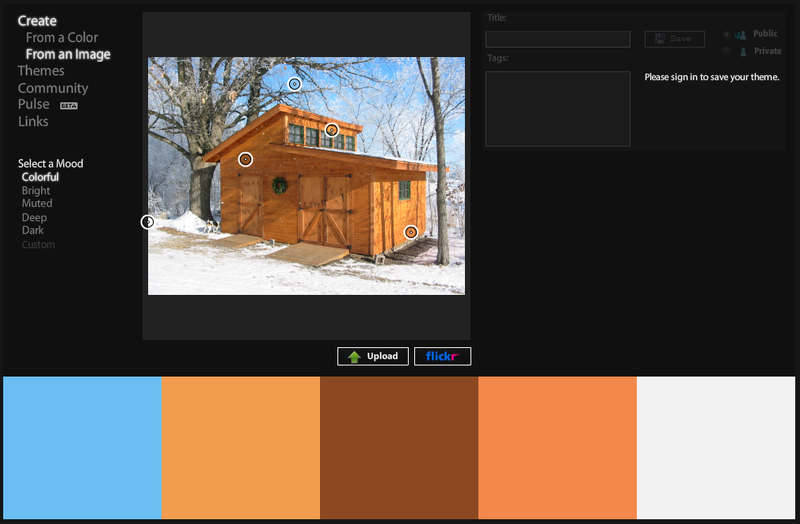 Adobe has created an online app, Adobe Kuler, that allows you to easily create sets of themed colors based on a starting color or an image. You can create a set of colors starting with a single color by selecting the From a Color option and then selecting one of the rules. (E.g. Analogous, Monochromatic, Triad, etc). After you pick the rule, you can click and drag on the center circle (with double outline) to change the starting color. You can also click on any of the other circles to effectively change the rule. You can also generate a palette of colors by starting with a picture. Here’s a set of colors based on a picture of my shed. After Kuler generates the initial palette, you can drag the little circles around to change which spots in the picture it uses to generate the palette. That’s a nice shed! Great website by the way. Thanks Simon! I no longer own the property with the shed, but it’s still with me in spirit.